As the ultimate destination of heat flowing from lower latitudes, the polar regions are an important component of the global climate. Heat exchanges between ocean and atmosphere are complicated by the presence of sea ice at the water-air interface. Sea ice is highly reflective, so absorbs little solar energy, but also has low thermal conductivity, so it insulates the water beneath from heat loss. Its presence also influences the transfer of momentum between atmosphere and ocean, as winds drag on the relatively rough surface of the ice. The formation of sea ice is a key driver of the vertical ocean circulation (thermohaline circulation), since only the fresh water component of the sea water freezes, leaving behind the salt. Salt-enriched water is more dense, so it sinks, forming the oceans' very cold "bottom water". This water spreads around the world in the ocean depths, eventually returning to the surface at lower latitudes to be carried back to the poles by the oceans' surface currents. Fresh water leaving the Arctic in the form of ice also exerts an important influence on the overturning that drives the North Atlantic Drift and Gulf Stream, which give western Europe its mild climate. More fresh water entering the North Atlantic from the Arctic could weaken these important surface currents, leading to a colder climate in Europe. Computer-based climate models are giving an ever more complete description of the world's climate by modelling, amongst other things, the flow of heat from place to place and between atmosphere, land and ocean. They are being used to answer questions such as how quickly is the planet warming up. 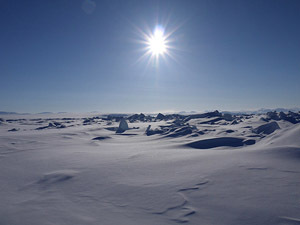 The polar regions, particularly the Arctic, are thought to be the most sensitive to global warming. But the complex and dynamic nature of sea ice in the Arctic Ocean presents a difficult situation to model. Changes in sea ice cover are one of the largest uncertainties in predicting global temperature change.